After the Global Crisis, political authorities and regulators shared a common view that executive compensation helped drive excessive risk-taking in the banking industry. Former US Treasury Secretary Tim Geithner, testifying in front of a Senate Appropriations subcommittee in June 2009, argued: “although many things caused this crisis, what happened to compensation and the incentives in creative risk-taking did contribute in some institutions to the vulnerability that we saw.” Academics have criticised the system of executive compensation in the banking industry for creating perverse incentives and excessive risk-taking (see, amongst others, Bebchuk and Spamann 2010 and Fahlenbrach and Stultz 2011). Risk, however, is an essential ingredient in the intermediation activity of banks. The core business of a bank’s CEOs is indeed to actively select (and hedge) different forms of risk, and therefore low-probability but high-impact events may affect banks’ overall performance. Therefore, optimal schemes for executive compensation at banks must take this into account. This point is taken to the extreme by Cheng et al. (2015), who claim that executives in banks should be ‘insured’ for the risk taken by the firms they run. Efing et al. (2014) argue that performance-contingent bonus payments affect both the profitability as well as the risk in banking. They assert that a good incentive system should target the optimal trade-off between the two. Hence, in the banking industry, we should employ pay-for-risk compensation, not only pay-for-performance. Bank managers, like many other sectors, have at least part of their earnings tied to the performance of the company. In the banking sector risks materialise with some lag, however, because the financial cycle lasts typically lasts more than twice as long as a traditional business cycle (Drehmann et al. 2012). In the boom period, volatility drops and banks take on more risk. But risks can materialise suddenly, leading to a sharp drop in performance from which it is difficult to recover. This was, at least, what happened during the Global Crisis in many advanced economies, when the price-to-book ratio for banks dropped below unity and then struggled to recover (Figure 1). Banks CEOs' compensation has been affected by this poor performance. Total compensation (i.e. the sum of salary, bonuses, equity shares and stock options granted in that year) halved to $3 million between 2007 and 2008 after the collapse of Lehman Brothers. This drop was more pronounced for investment banks than for commercial banks (Figure 2, left panel). The structure of CEO compensation has also changed. In particular, the variable compensation component (the total compensation minus the fixed salary) dropped after the Global Crisis. More recently it has risen again, especially in investment banks (Figure 2, right panel). Source: S & P Capital IQ. How much of the above trends can be attributed to a simple reduction in banks’ profits, and how much to changes in the regulatory framework? After the G20 meeting in 2008, the Financial Stability Board (FSB) was mandated to provide new guidelines for sound compensation practices at financial institutions. These guidelines, which were to be implemented in FSB jurisdictions from January 2011 (and adopted by EU countries through the Capital Requirements Directive IV since January 2014), focused on the design of executive compensation for all material risk takers in banks, including CEOs. Managers must be compensated according to their own marginal contribution to bank risk. Compensation must vary in a symmetrical way, either up or down, conditional on performance and risk outcomes, allowing enough time between the action and the materialisation of the risk. Banks can choose their optimal combination between cash and equity rewards with the objective to moderate excessive risk-taking. Have the Principles and Standards been effective? The introduction of the Principles and Standards represents an ideal experiment because not all banking systems were affected. This makes it easier to distinguish the impact of compensation practices on banks headquartered in FSB and EU jurisdictions, which have been affected by the new rules (‘treated’ banks), from that on financial intermediaries in other jurisdictions, which were unaffected, i.e. the ‘control group’ (‘non-treated’ banks). In a recent paper, we perform this test using data for 173 large banks located in 36 different countries (Cerasi et al. 2017). Figure 3 shows the average share of variable compensation for four subsamples of banks, by comparing the group of affected banks with that of unaffected banks and by comparing institutions classified as investment banks with commercial banks. It is evident that affected banks reduced the compensation for their CEOs after the year 2010, while those in the control groups did not. Notes: Average values for the share of variable compensation in the three years 2006, 2010 and 2014 for treated vs. other banks (Investment vs. commercial banks). Source: S&P Capital IQ; authors’ calculations. In the econometric analysis – controlling for bank-specific characteristics, macroeconomic factors and institutional differences – we evaluate how the sensitivity of variable compensation for CEOs to performance and risk changed after the two groups of banks adopted the Principles and Standards rules. The results indicate that the pay-for-performance, measured as the sensitivity of CEOs compensation to return-on-equity (ROE), has declined for banks exposed to the policy. Before the introduction of the Principles and Standards, a 1 percentage point (pp) increase in ROE was associated with an increase in the proportion of variable to total compensation of about 0.5 pp. After the introduction of the policy, this sensitivity has dropped by half. By taking the stock return volatility (SRV) as a measure of bank risk, the sensitivity of CEOs compensation to risk has increased for banks exposed to the Principles and Standards. Before the introduction of the policy, CEOs compensation was virtually insensitive to an increase in SRV. After the adoption of the policy, a 1 pp increase in the SRV is associated with a decrease in the proportion of variable to total compensation of 2.5 pp. Our analysis suggests that the introduction of the Principles and Standards was effective. But we also find that the effects differed across banks. In particular, the impact on variable compensation was especially strong for investment banks and for banks that previously had weaker risk management (i.e. those that previously lacked a chief risk officer on the board). This indicates that regulation is more effective in banks for which risk management has a less prominent role in governance, a point made by Ellul and Yerramilli (2013). There are still many open questions regarding executive compensation. While post-crisis regulation has responded to the need to increase banks’ resilience and mitigate risk, we still do not fully understand what the optimal amount of risk would be. Moreover, the Principles and Standards rules are not one-size-fits-all. Each bank must find its own way to apply them, depending on its own specific characteristics. The trade-off between financial stability and long-run growth requires a regulatory design that does not just limit risk, but induces a ‘healthy’ level of risk by taking into the difference in bank business models. Authors’ note: The views expressed in this column are those of the authors and do not necessarily reflect those of the Bank for International Settlements or the Financial Stability Board. Bebchuk, L and H Spamann (2010), “Regulating Bankers’ Pay”, Georgetown Law Journal 98(2): 247–287. Drehmann, M, C Borio and K Tsatsaronis (2012), “Characterising the financial cycle: don’t lose sight of the medium term!”, BIS Working Papers No. 380. 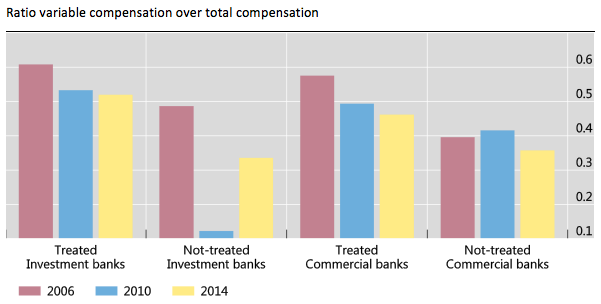 Cerasi, V, S M Deininger, L Gambacorta and T Oliviero (2017), “How post-crisis regulation has affected bank CEO compensation”, BIS Working Papers No. 630 (also published as CEPR Discussion Paper No. 12008). Cheng, I H, H Hong and J A Scheinkman (2015),”Yesterday’s heroes: Compensation and creative risk-taking”, Journal of Finance 70(2): 839–879. Efing, M, H Hau, P Kampkötter, and J Steinbrecher (2014), “Incentive Pay and Bank Risk-Taking: Evidence from Austrian, German, and Swiss Banks”, CEPR Discussion Paper No. 10217. Ellul, A and V Yerramilli (2013), “Stronger risk controls, lower risk: Evidence from US bank holding companies”, Journal of Finance 68(5): 1757–1803. Fahlenbrach, R and R M Stulz (2011), “Bank CEO incentives and the credit crisis”, Journal of Financial Economics 99(1): 11–26. Financial Stability Forum (2009), “Principles for Sound Compensation”.